Première exposition personnelle en France, dans la galerie – du 5 octobre au 5 novembre 2017. 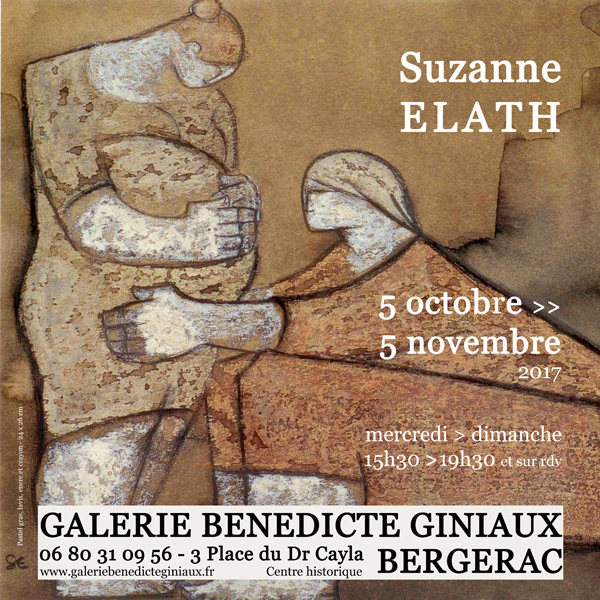 Exposition Suzanne Elath à Paris – les 14, 15, 16, 17, 23 et 24 mars 2019. Born in 1924 in Vienna (Austria), she studied at the « Ecole des Beaux-Arts » in Paris (France). Afterwards, she lived more than sixty years in Israël, near the rocky desert, whose landscape strongly influenced her work. Her figures seem sculptured. They have the texture of stone and express a calm force. She uses oil pastel, wash, ink and pencil. Her themes are maternity, encounter, mourning, and solidarity. The deep looks meet and form silent dialogues. A certain intimacy is disclosed in every drawing, with impressive figures, drawn with free and thick lines, kind of giants full of love and tenderness. B.G.